For this post I'm gonna do a sponsor post for two stores since I used them together in my pictures. 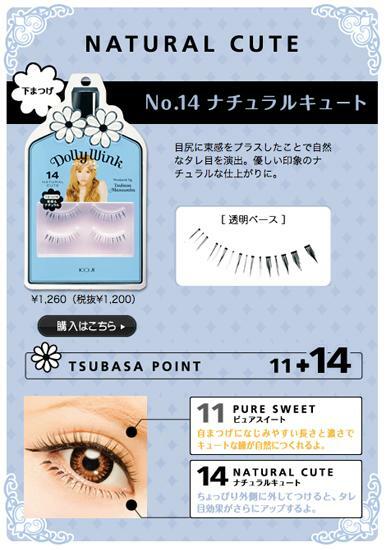 I really love the style of these lower lashes because it really looks like Dolly Wink lower lash #14 Natural Cute. Although it might cost more than Dolly Wink you do get 10 pairs in this box. The band is strong and isn't flimsy and it's transparent too so makes blending in even better. The lashes are pretty sturdy as well. They aren't super soft like real lashes. Lash glue comes off easy and you don't have to worry about pulling off any lashes with it. They're 100% handmade so you know someone took a lot of time and work to make these for you!!! In this picture I had took two pair of lashes and chopped them up into individual pieces. I definitely love these lenses because of the different color used. I think these are also the newer vassen circle lens that just came out. It's got a 5 star rating on the site also! So you know this lens is good. But like always, the packaging from LoveShoppingHolics is always cute! Pink little bunny bag and that bow box! Plus a little thank you card. Design is just so pretty! I really like the different splash of color. 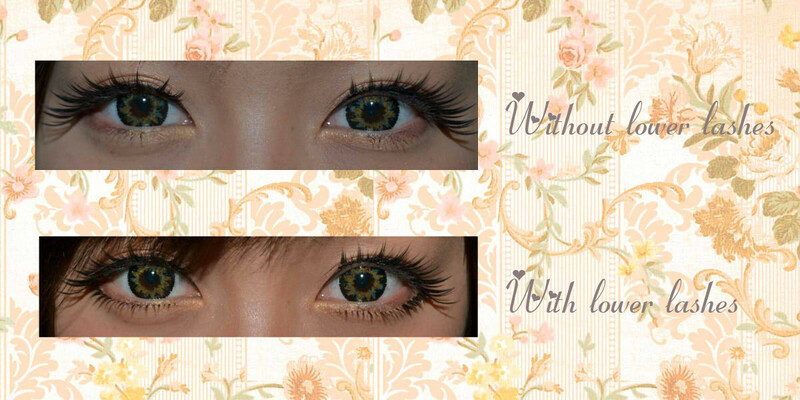 Makes you think twice if you really are buying a brown lens, a green one or a blue one. As for it being 14.5mm it really feels a lot bigger!! My eye enlargement looks way bigger in these then my other 14.5mm lenses. So definitely an A+!! These feels nice and comfy. After a few minute of putting them on they feel like they aren't even there anymore. Super love these. Good price and design! I just wanted to tell you guys that I just recently got two cute little bunnies!! !Ｏ(≧▽≦)Ｏ But I'll show you them in my next post. And as for the hair extensions, that will also be in a future post so stay tuned!! Whoa! 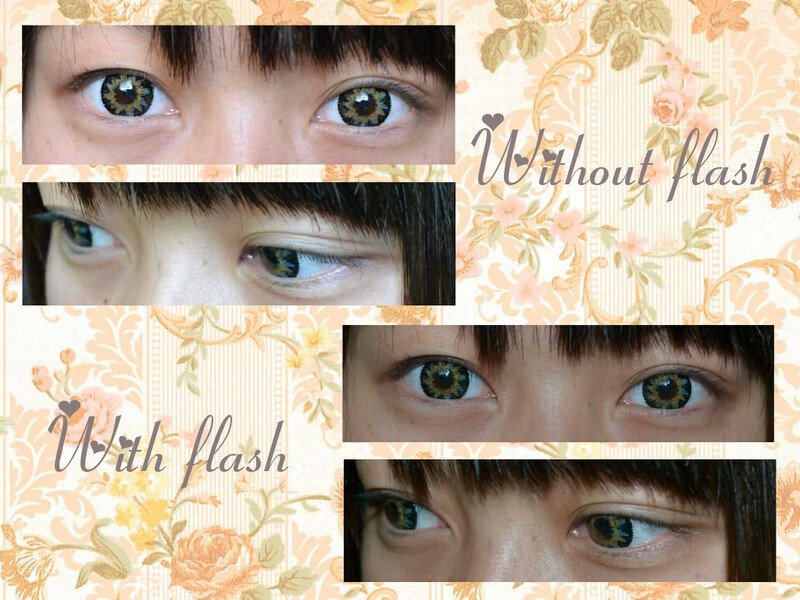 Those are some very interesting looking circle lenses! I never would've guessed they were suppose to be brown lenses. I seriously thought blue or green. It's pretty cool though! I really like them too!! so pretty! you both are!personally i don't like the design on these lenses up close but from far away they look great. I really need to invest in bottom lenses cause they make eyes look bigger! 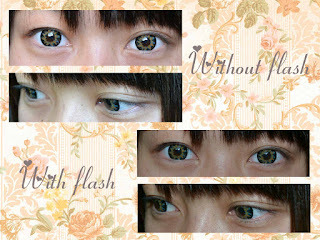 I have these lenses tooo but i felt like an alien :( They do look awesome on you :o. And i like the lower lashes, i gotta buy some new ones but i'm broke af at the moment meeehp.